Bernage, Georges. D-DAY LANDING BEACHES: The Guide. NEW copy, PAPERBACK. 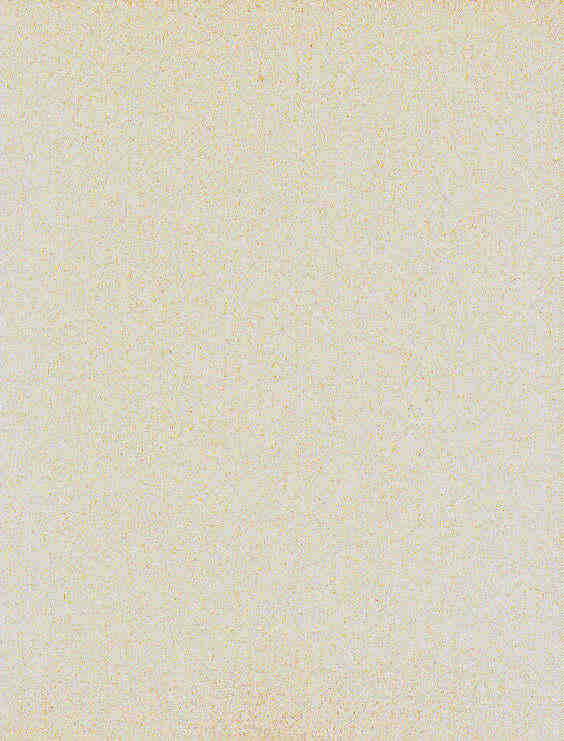 (Heimdal, 2004). Illustrated in full color with photographs. 9x12, 96 pages. ~~~ This spectacular, large format, full color, new book is quite simply the most impressive book of its type we have seen. Packed with over 200 photographs, maps and charts, the book is divided into the sectors associated with the Normandy landings in 1944. 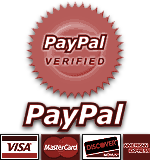 What's more it is extremely reasonably priced. 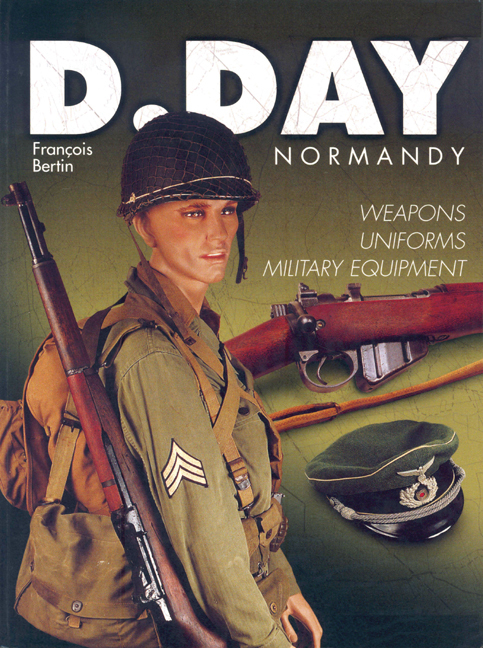 Bertin, F. D-DAY NORMANDY: Weapons, Uniforms, Military Equipment. NEW copy, PAPERBACK. (Casemate, 2007). Full color illustrations throughout. 7x10, 128 pages. ~~~ A complete panorama of the weapons, uniforms and military equipment of all the soldiers that fought at D-Day, both Allied and Axis, illustrated with more than 300 specially commissioned full color photographs. 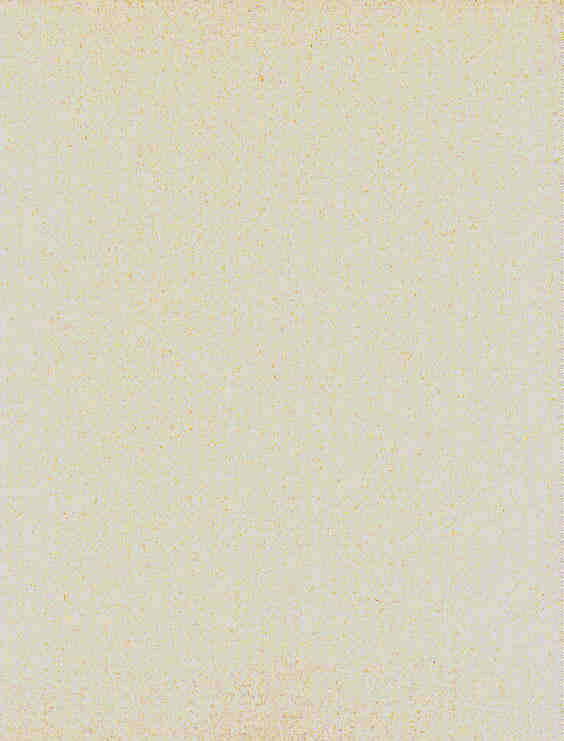 ~~~ Everything from weapons, helmets, uniforms, vehicles, canteens, personal equipment and much more are shown here in precise detail. The photographs are accompanied by detailed captions explaining what is shown. ~~~ Francois Bertin is a leading D Day historian and collector. His insightful narrative and captions will be of great interest to all collectors of World War II uniforms and equipment and the detailed photographs will be of interest to military modelers. 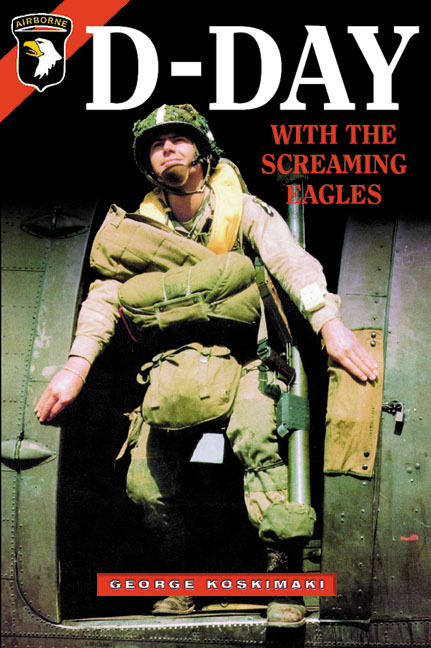 Bowen, Robert M., FIGHTING WITH THE SCREAMING EAGLES: With the 101st Airborne from Normandy to Bastogne. NEW copy. Hardcover with dust jacket. (Mechanicsburg, PA: Stackpole Books, 2001). Bibliography, Roll of Honor, 256 pages. ~~~ "Robert Bowen found himself unexpectedly assigned to the 401st Glider Infantry Regiment, shortly after joining the US Army. His service with the 101st begins with intensive training in North Carolina, where he forges friendships with fellow company members and prepares for combat in Europe. 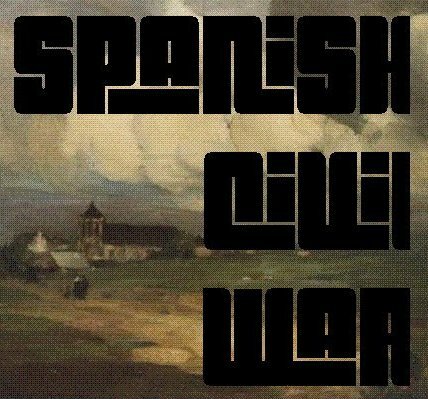 Transported to Britain, Bowen witnesses first-hand the devastation in the cities and is bemused by the wartime strictures of his new environment. As training continues, the division sense that something important awaits them, and that -- as prophesied by one of the men -- 'Uncle Sam needs something for his money'. Shortly after, they receive their brief on Operation Overlord. As reserve to the 4th Division at D-Day, Bowen and fellow division members storm ashore amid the chaos on Utah Beach. They experience the ultimate test: picking their way through unfamiliar terrain littered with minefields and hidden snipers, while keeping track of ever-changing commands. Bowen is injured on D+1, but goes on to participate in the perilous airborne assault over Holland, where as platoon leader during the fighting he is forced to make vital decisions in the face of mounting casualties. When exhausted troops are moved to the Ardennes to participate in the Battle of the Bulge, Bowen falls victim to a second injury which leaves him at the mercy of advancing German troops. He becomes a POW just days before Christmas 1944, when the 'trip through hell' truly begins. Written shortly after the war -- but never before published -- Bowen's narrative is immediate, direct and compelling. His account, one of the few by a member of a glider regiment, is a brutal insight into the battlefields of World War II and a vivid recreation of just what life was like in an elite unit. From the horror of D-Day and the despair of captivity, to personal recollections of ordinary men in an extraordinary conflict, this memoir tells the story of one man's total war." Crosby, Francis. D-DAY: Rare Photographs from the Wartime Archives. NEW copy, PAPERBACK. (Pen & Sword, 2004). 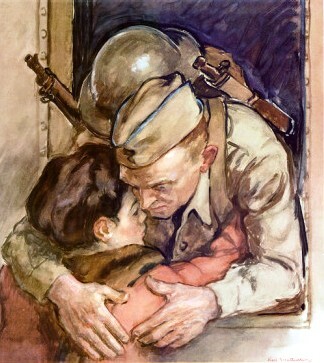 Part of the "Images of War" series. 250 black & white photos. 7.5x9.5, 112 pages. 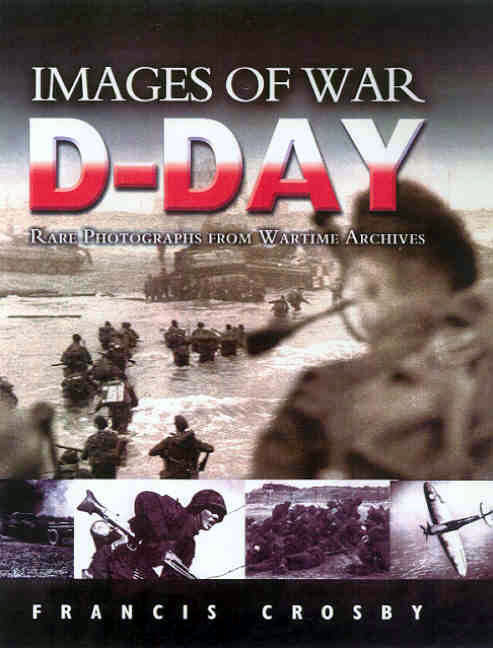 ~~~ This is a spectacular photographic record of the D-Day invasion that captures many different aspects of the air, sea and military campaign. A great majority of photographs are unlikely to have been seen by the general public and they have been superbly reproduced directly from original negatives held by national archives in Britain and the USA. Lengthy captions describe the action portrayed in each photo and an introduction puts D-Day into its historical perspective. 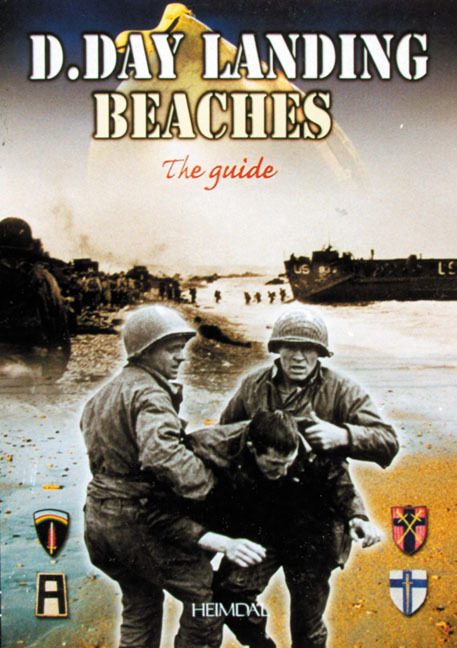 The book follows the invasion as it develops and contains chapters on Preparation, The Landings, Establishing the Beach-head, Moving Inland and Sustaining the Advance. ~~~ Francis Crosby works for a national museum in Britain and has had access to enormous wartime archives. He has written extensively on historic aviation and has had five books published on the subject as well as acting as a consultant for the media and publishing industry. Jacobs, Peter. AIRFIELDS OF THE D-DAY INVASION AIR FORCE: 2nd Tactical Air Force in Southeast England in WWII. NEW copy, PAPERBACK. (Pen & Sword, 2009). 60 black & white photos plus 15 maps. 5.5x8.5, 176 pages. 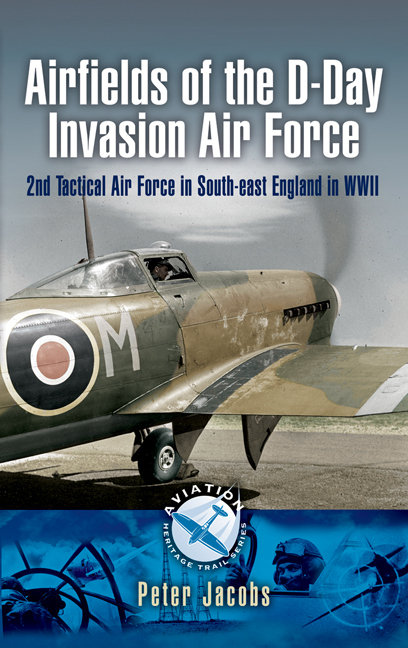 ~~~ As part of the Aviation Heritage Trail series, the airfields and interest in this book are concentrated in a particular area � in this case Kent, Surrey, East Sussex, Essex and Greater London. The South east of England emerged from six years of war with a rich diversity of RAF bomber and fighter airfields used by the 2nd Tactical Air Force, both before and after the D-Day landings. Much of this proud legacy is now threatening to disappear. However, the tourist can combine visits to an abundance of disused and active airfields, country houses and museums with countless attractions, imaginative locations and broadband and coastal hideaways that have no equal. ~~~ The airfields and other places of interest include Northolt, Manston, Sculthorp, Dunsfold, Swanton Morley, Hunsdon, Gravesend, Detling, Biggin Hill, Kenley, Redhill, Gatwick, Heston, Hornchurch, Chailey, Coolham, Horne, West Malling and Newchurch. ~~~ This book looks at the history and personalities associated with each base, what remains today and explores the favorite local wartime haunts where aircrew and ground crew would have sought well-deserved entertainment and relaxation. Other museums and places that are relevant will also be described and general directions on how to get them included. Koskimaki, George. 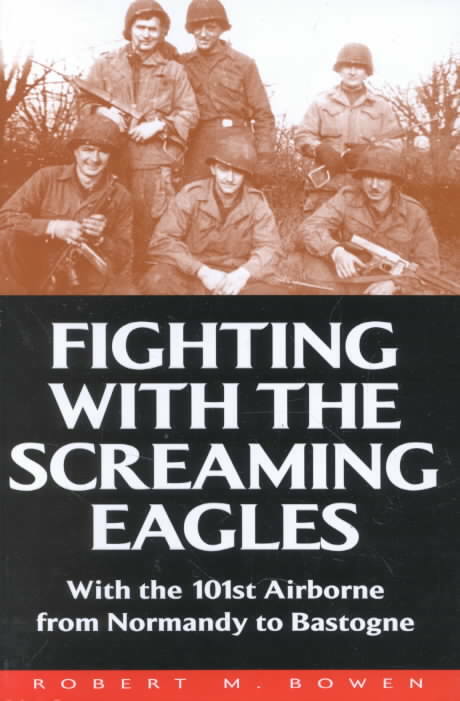 D-DAY WITH THE SCREAMING EAGLES. NEW copy, hardcover with dust jacket. (Casemate, 2008). Black & white photos. 6x9, 380 pages. ~~~ Many professional historians have recorded the actions of D-Day but here is an account of the airborne actions as described by the actual men themselves in eyewitness detail. 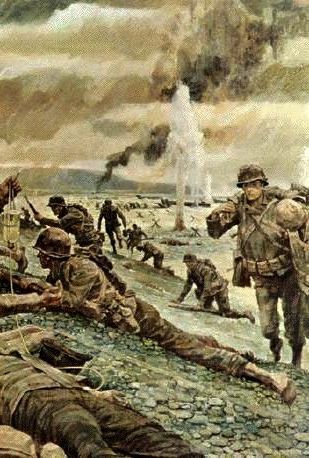 Participants range from division command personnel to regimental, battalion, company and battery commanders to chaplains, surgeons, enlisted medics, platoon sergeants, squad leaders and the rough, tough troopers who adapted quickly to fighting in mixed, unfamiliar groups after a badly scattered drop - and yet managed to gain the objectives set for them in the hedgerow country of Normandy. This book is primary source material. It is a "must read" for anyone interested in the Normandy landings, the 101st Airborne Division and World War ll in general. Hearing the soldiers speak is an entirely different experience from reading about the action in a narrative history. Liddle, Peter. D-DAY: By Those Who Were There. NEW copy, Hardcover with dust jacket. (Pen & Sword, 2004). Illustrated throughout. 6.5x9, 288 pages. ~~~ Drawing upon a new international archive of the Second World War, the support of veterans world-wide and from archives overseas, the author uses previously unpublished letters, diaries, photographs and reminiscences to tell the story of D Day in a way which brings the reader closer to the actual experience. from an aerial, naval and land perspective the events of D Day are captured superbly in wartime contemporary and retrospective documentation. ~~~ Each of the beaches is fully represented. American, Canadian and British testimony is supported by new, compelling, German material. Appropriately the RAF and Merchant Navy experience appear as do the contemporary and retrospective reactions of women �in the know� and those whom knew from �unofficial sources� of the immediate imminence of the assault. Penrose, Jane (ed), THE D-DAY COMPANION: Leading Historians Explore History's Greatest Amphibious Assault. NEW copy, hardcover with dust jacket. (Osprey Publishing, Ltd., 2004). Maps, photographs, notes, bibliography, index, 288 pages. ~~~ "Published to commemorate the 60th anniversary of the Normandy landings, this book brings together the perspectives and opinions of some of the most respected military historians working today. More than a dozen leading historians from either side of the Atlantic have collaborated to produce a unique and incisive examination of the momentous events that surrounded June 6, 1944. Operation Overlord saw two of the Allies' greatest military strategists, Eisenhower and Montgomery, pit their wits against Hitler in a bold bid to liberate continental Europe. 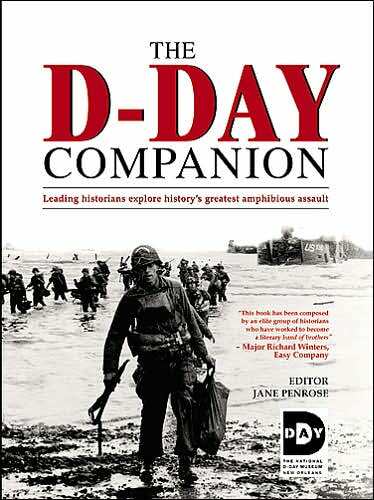 Each chapter of this new book focuses on a different aspect of the D-Day landings, from the build-up to the attack to the experiences of the troops on the ground." ~~~ From Library Journal: "To mark the beginning of the liberation of Western Europe from Nazi occupation, the publisher has put together a first-rate examination of this event. The D-Day Companion, officially endorsed by the National D-Day Museum, combines the talents of some of the biggest names in military history, including Allan Millett, Williamson Murray, and Carlo D'Este. The chapters are thematic, covering topics like the evolution of the Supreme Headquarters Allied Expeditionary Force (SHAEF), German plans for defending the coast, and the paratrooper drops. Most of the coverage is at the strategic level, although some tactical coverage and personal accounts are included. 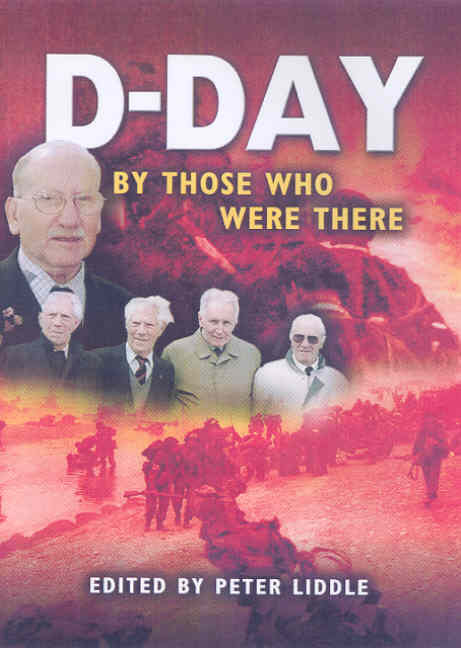 This book will be a great resource for those looking for a 'big picture' of D-day or whose only exposure has been through squad-level books like Alex Kershaw's The Bedford Boys or Stephen Ambrose's D-Day: June 6, 1944. Highly recommended.